Top Ten Tuesday is a meme hosted by The Broke and The Bookish. The theme for this week is books set in – setting however I am shifting this to the best high fantasy settings because I feel like this is something I have more thoughts on. My definition of high fantasy is a novel that takes place entirely in a world that has different rules to ours. And please remember that I haven’t read all the fantasy books out there so some important ones (e.g. Middle Earth) won’t be on there. I also removed all books that directly referenced previously being our Earth. 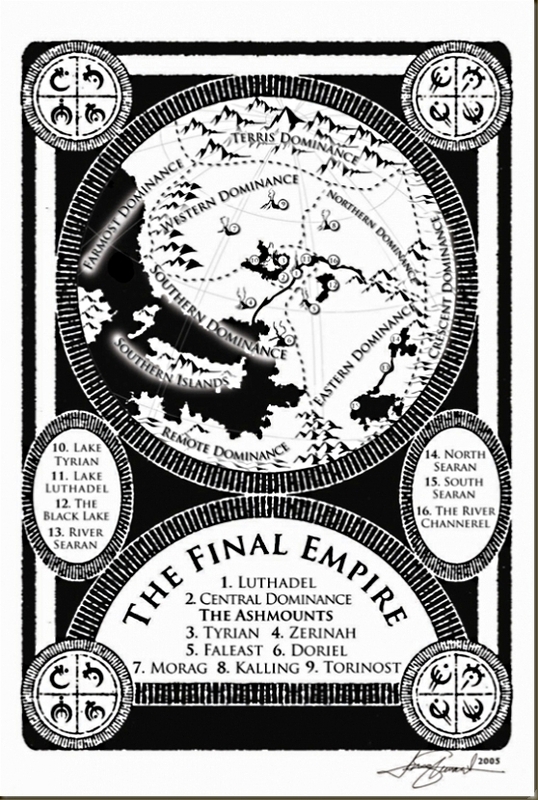 I have only read the first book in this series which is aptly named ‘The Final Empire’ (my review here) however I can already tell that this world is amazingly built. The world this series takes place in is called Scadrial and it has a few key differences from Earth. Firstly, at least in the first novel, leaves and grass are brown and ash falls from the sky pretty much constantly. At least that was my interpretation. Secondly, some of the people in this world possess an ability called Allomancy which is their form of magic and uses metals as a fuel. This world is amazingly through out and the world building is easily sprinkled throughout the text. It manages to be a very big world while still focusing on the story and characters so hopefully it stays that way. This series is amazing, (on a side note would you be interested in a full review? because I do want to reread this series) and the world building makes it even better. 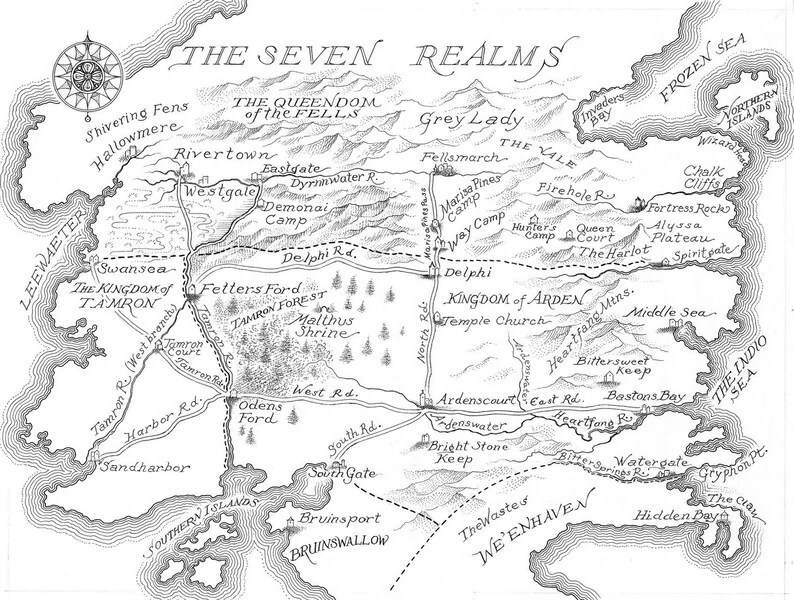 Although being called the seven realms trilogy and there being seven areas present, most of the story takes place in the Queendom of the Fells, the capital city of which is called Fellsmarch.World building is at its best when it adds something to the plot of the story, and in this case the politics and physical geography of the Queendom is very much a part of the story. It has a quaint feel to it that isn’t quite medieval, I would compare it more to the Elizabethan era except with a few less developments and more magic. The level of political tension is about the same (that is to say high). The cultural aspects of life in the Queendom are well developed with traditions and religions that are well set in the values of the people there. I think this is my dream fantasy world… I just love the story so much. Despite the world building being quite focused on only a small part of the world, the history is so rich I am kind of ok with it. There is a complex religion and the whole fever that swept through. Along with an interesting array of fantasy creates to make things just a little bit more interesting. This world is said to be similar to the renaissance era and I have to agree. It is a world of religious conflict and artistic pursuits. I am so excited for the release of ‘The Midnight Star’ and can’t wait to see the rest of the world building in this. You didn’t think that I could go without including Adarlan did you? And I know that Terrasen is far better but Adarlan is where most of the story takes place. Despite the brutish ways and possibly evil destruction of the lives of happy people, the King of Adarlan knows *cough* how to keep an empire running. Most of his people don’t seem to bothered by all the drama, and the noble class is still functioning as normal. The Throne of Glass series doesn’t actually provide much travel throughout Adarlan, however The Assassin’s Blade novellas have a lot of travel in them which showed off the full empire. This empire is the setting of the book Novice which a read a short while ago. (my review here). I really liked how this setting didn’t feel like just another magic using medieval Europe rip off. The magic system is well developed and very original, involving summoning demons from other worlds. The setting is an early industrial revolution one which manages to maintain the familiar small village and hunting style life style yet there are still new settings and opportunities. I read this series when I was pretty young but I really enjoyed it. The plot is cute, but more importantly the culture is so well developed and the images of desert sands stuck with me long afterwards. The story started off small but especially in the last novel there was a large world view. I found that the world was a good way to start out in the fantasy genre because it was pretty similar to ours. This is another series that I read when I was reasonably young but it left a lasting impression on me. The world is so well developed and just keeps expanding. There were so many places, and so many cultures. Maybe it did end up being a bit too big and confusing but there was so much history revealed and interesting groups of people to meet along the way which made up for it. I would highly recommend this series and am quite attached to the world. Sitia is one of two kingdoms in Maria V Snyder’s extensive fantasy world, the other of which is Ixia. This world has a timeless feel. It’s not medieval, and it is certainly not modern, but its not really anywhere in between. Sitia is clearly its own world and has a distinct culture and history. When I read this series I became highly obsessed, the author manages to make it come alive so vividly in my head. Each setting is so unique and I especially love the second novel chase through the rain forest. This actually ended up being harder than I expected… wow. I couldn’t quite find ten but this is still a solid list of well developed fantasy worlds that aren’t on future or past versions of our own Earth and rather on their own world. Do you have any ideas of kingdoms that belong on this list? 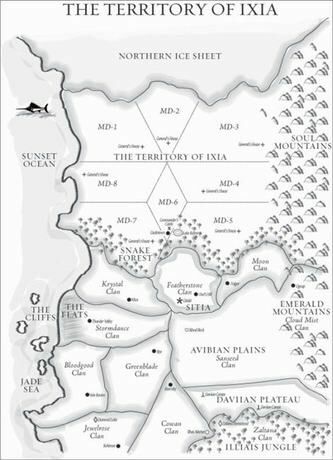 When I read about Sitia and its military structure, I loved how different It was from other fantasy worlds. I really like how it contrasts with the culture in Ixia. Very cool list, with lots I’ll be looking up. Love the Throne of Glass world! I love your take on this week’s topic! High Fantasy is one of my favorites :) I have read most of these, but there are a couple I need to go check out now. Love your list although a few on here that I need to check out! What about the Lies of Locke Lamora or if you like Sanderson Way of Kings? I will have to check those out, I haven’t heard of Lies of Locke and haven’t gotten around to Way of Kings. I loved the Study series! Especially how the two kingdoms contrasted! I’ve also really enjoyed what I’ve read of the Throne of Glass series so far. Great list! Great list! I love the setting in The Young Elites and Adarlan. Another one of my favorites is the Grishaverse (Ravka, Fjerda, Ketterdam, and others). I love how Leigh Bardugo’s fantasy world has different countries/kingdoms based on different countries and not just one (does that even make sense?). I also really want to read the Mistborn series, I’ll get to it someday.